Today, another palm from Madagascar, and a very distinctive one; so much so that I am confident that I have identified it correctly! 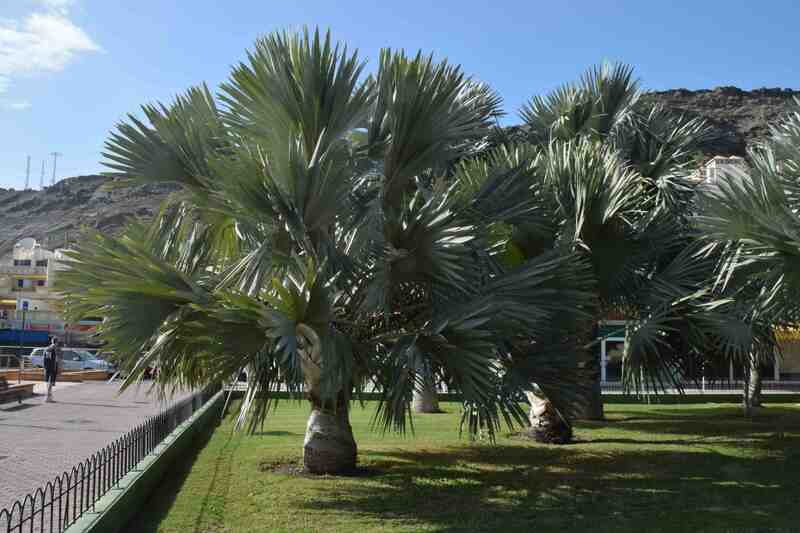 It is a large fan palm with huge leaves in a beautiful silvery blue. It is named after Otto von Bismarck and the name ‘nobilis’ means noble, which is appropriate. It is one of the commonest palms in Madagascar, in the north and west and grows in a wide variety of habitats, often in dry places which may explain why it has done so well in cultivation. Although it grows best in tropical climates it will tolerate Meditteranean climates and will survive light frosts, although that will slow growth.In hot climates this is a fast growing palm that can produce up to two leaves per month. The magnificent leaves are fanshaped with some spines on the petiole and can be 3m in diameter, covered in white wax and some scales. There is a green-leaved form but this is rarer (and less hardy) and would not be as striking. I think last year at the Chelsea Flower Show one was part of a show garden and got great attention from the media.